Northeast Philadelphia native Jack Swiker won an Emmy for his work on Entertainment Tonight and will have his short film screened at Cannes Film Festival. Having lived in Los Angeles for more than a decade, Jack Swiker has noticed a few differences between the desert heat and the weather in Northeast Philadelphia, where he grew up. “I’ve never had to use an ice scraper out here,” he said. Even though he misses quick trips to Steve’s Prince of Steaks and going to Phillies games with his family, he started thinking of the City of Angels as home a few years ago. 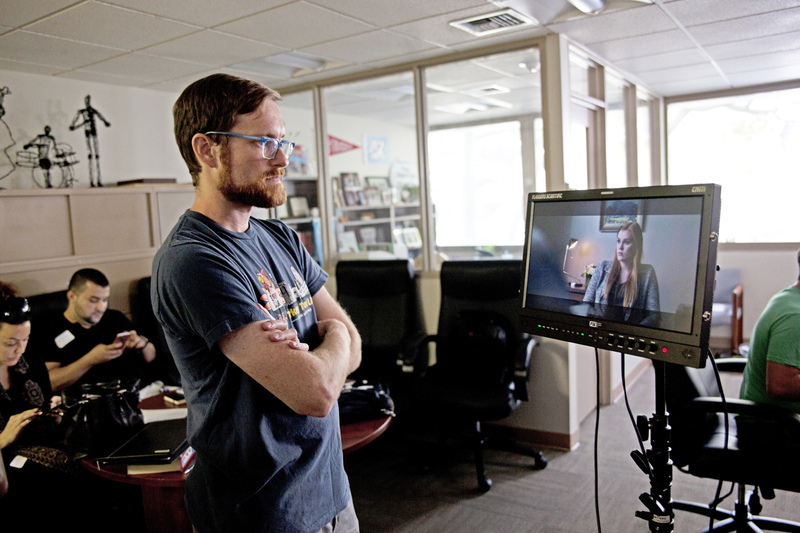 The Archbishop Ryan grad has forged a career in film and media, earning an Emmy Award for his work on Entertainment Tonight and submitting a short film that will be screened at Cannes Film Festival. Swiker completed a few film projects while at Archbishop Ryan that sparked his interest in the medium and pursued further film opportunities in college at Rowan University. He moved to L.A. in 2007 for a job with a production company, arriving in the city the same day the Writers Guild of America strike began. A few months later, he was hired at pop culture broadcast Entertainment Tonight, where he’s held multiple positions. “I’ve gotten to do pretty much every aspect of television production,” he said. Currently, he coordinates voiceover production for the program’s news packages. Anchors such as Nancy O’Dell and Kevin Frazier come to his office to record their lines. In a previous position at the company, he started columns about “this day in history” and charitable works celebrities were performing. Swiker, along with the rest of the Entertainment Tonight staff, received the Daytime Emmy Award for Outstanding Entertainment News Program in 2018. Entertainment Tonight has won the title four out of the five years it has been distributed, but the award was recently expanded to include only its production team. Aside from production, Swiker is a film director. He’s participated 10 times in the 48 Hour Film Project, a worldwide challenge that has teams create an entire short film in the span of just a single weekend. Teams are assigned a genre and a prop, character and line of dialogue they must include at the beginning of the challenge. Each city chooses a winner to represent them at the worldwide competition, where the top 10-13 films are selected to be screened at Cannes. Swiker’s silent film Silence was selected to be screened at Cannes. The film follows a woman’s struggles to reintegrate back into society after losing her hearing in a tragic accident. “Surprisingly, it’s the first time a film from L.A. will be represented at Cannes for this competition,” he said. To create Silence, the actors had to learn sign language. Swiker’s team was able to find an American sign language instructor overnight who showed up the next day to teach the actors. “They learned the basic things within the first hour,” he said. Much of the film also relies on music and audio, used sparingly throughout. The film utilizes music to build tension in key scenes, but mostly relies on its lead actress to tell the story. Swiker said at screenings in theaters, he could see people trying not to move and make as little noise as possible. Silence isn’t publicly available yet, but Swiker’s previous entries, mystery film Sessions and drama film Boy Soldier,are available on YouTube. Boy Soldier was selected as the Los Angeles winner of the 2016 48 Hour Film Project. “Getting to go to Cannes is a life goal dream sort of thing, something you always think about. Like hitting a home run in the bottom ninth in game seven of the World Series, this is that for filmmakers,” he said. Though he’s busy on the west coast, he tries to visit his family in Northeast Philly at least once a year. “I want to try to catch a summer visit to see the Phillies,” he said. If not, he’ll settle for a shorty and lemonade from Wawa.